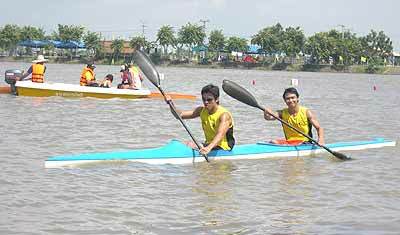 Tanikron Boonmuen and Piyaphun Phaophat won Gold medals in 200 m.
Kayaking is on the rise in Chiang Mai. If it were not for the men and women of the Chiang Mai Kayak team, winning 14 medals, Chiang Mai Province would not have been placed third in the nation at the Suphanburi Games held between September 10 and 20, 2006. The athletes on the Chiang Mai Kayak team won 11 gold, 1 silver and 2 bronze medals out of 18 races. If you find yourself walking or driving along the Ping River between 4:30 pm and 7:30 pm please stop and cheer on the Kayakers who are sure to pass by during that time. They can be seen between the damn south of the Army Base and the Super Highway Bridge. These days it’s not often we see the top three placings of a Royal League event without a tie involved, but last Thursday’s Stableford tournament at the Highlands Golf and Spa Resort resulted in clear cut positions, with Peder Koch taking the winner’s rostrum and moving 7 places up the Prize Winners List to 14th. The four par 3s at Highlands are considered by some to be the most picturesque in the area. Peder, however, wasn’t just looking at the scenery when he set about parring three of them and birdying the other. Apart from recording 13 points on those four holes, he also achieved three more pars and, off a 21 handicap, took the advantage where two strokes were awarded. He drew a blank on only two greens to end up with a Stableford tally of 41 points. Steve Polaski’s gross score of 80 and 37 points was enough to put him into second place. Steve played a steady game last week - shooting an outward half of 39 and coming home in 41 – but double bogeys on the 11th and 12th let him down. The 11th is proving to be a nemesis for Steve since they put the tee box back forty yards, and no matter what club he uses the ball seems to end up in water. Someone should ask if Jack Cooper has taken golfing lessons or simply possesses a naturally gifted swing. Some Royal Leaguers regard it as being near to perfection in terms of tempo and last time out it enabled Jack to achieve a round to handicap and 36 points, which gave him third place. Meanwhile, positions in the Happy Bar Stds. eclectic competition fluctuated slightly over two days. 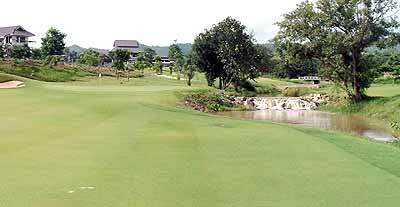 At Mae Jo Golf Club, last Monday week’s Stableford tournament was played from the back tees and Jim Catterson came in winner with 36 points. Second placed Jim Cannon managed to improve his eclectic score by three strokes, and Dennis Woerner, who did likewise, joined Tom Ingham – tied at the top of the table. On the following Thursday, Tom Ingham rose to the challenge by not only taking the day with a net score of 72, but also reducing his eclectic tally by 3 more strokes with pars on the 5th and 6th and a birdie on the 10th. However, Jim Cannon was also firing on all cylinders and he too cut his eclectic score again by 3, which included a fine birdie on the par 5, 16th. For more information about The Royal League visit www.theroyalleague.com, and for Happy Bar Stds. Ring Noel on 089 256 5705. A very good turnout of pool players and supporters found themselves at Half Moon Pub once again last Friday for the Chiang Mai Pool League trophy presentation. Unfortunately, the Moon team was without a couple of key members. After landing the title for the third time and second year running, Half Moon’s captain Brian was holidaying in Germany and so vice skipper Kevin stepped in to do the honours of receiving the winner’s trophy from pool supporter David Hardcastle of Good Morning Chiangmai News. Kevin went on to say that his side would like to dedicate this season’s achievement to Jason the Minger, who is currently in England. Jason might not have been the Moon’s strongest player, but he was their best supporter and always at hand to do his part on the green baize when needed. What a minger is exactly, is open to debate, but after consulting several word books, I suppose it could mean someone who likes the ladies – and why not? Half Moon Pub has proved to be the side to beat since the League was formed and their accomplishments have been down to teamwork, consistency and a mix of youth and experience. We mustn’t forget that their two veterans, Ron and Brian, are the two oldest players in the League. So, once again, well done Half Moon Pub and, as winners, thank you for hosting the party last week. The rest of us will be out to change the presentation venue at the end of next season. Friend’s Corner will no doubt lead an assault on the champs after pushing them nearly all the way last term, ending second. Just a few season’s ago, Friend’s came bottom of the league and many of their opponents wondered if they would have the courage to continue. They had, and that has led to Edwin, Erik and Tu picking up the runners-up trophy from David last week. This has been Friend’s Corner’s last season in the League as next term they will be renamed Em and Em. It’s a pity there are no cups or medals for third spot, and so Jack took a bow on behalf of luckless Chiangers and Bangers, who managed to secure the number three slot for the second year running. Last but not least, one of the League’s founders, John Whiting, announced his retirement as coordinator several weeks ago. After five years of single handedly working out fixtures, collating results and league tables, administering rules and on the odd occasion discipline, he decided to step down and let someone else have a bash. In appreciation for an excellent job well done, members of the league presented Scottish John with a teddy donning a tartan tam-o’-shanter. Thanks a lot John, and now we look forward to Shaun’s administration next season. Shaun has every intention of keeping the League’s traditions alive by changing very little in the way of rules etc. New fixture lists will be circulated by October 8 and four new sides could be included. We thank Shaun for taking on this task and wish him all the best. Next season breaks off on October 13, so see you then.